To the right is a diagram excerpted from "Who Pays a Sales Tax?" Understanding this diagram, including consumer surplus and producer surplus, is a benchmark for learning to think like an economist. Working with the Classic Economic Models will help you learn to think like an economist (and get higher grades in your economics classes). The microeconomics collection includes Theory of the Firm and Theory of the Consumer. 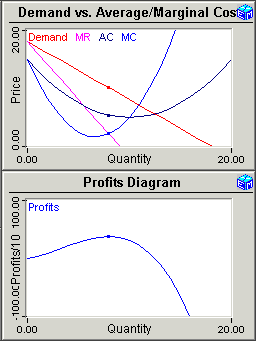 To the left is a diagram from the interactive exercise on profit maximizing behavior for a monopolist. The Classic Economic Models also includes profit maximizing behavior under perfect competition and price discrimination. 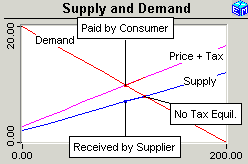 The Theory of the Consumer is based on the "Two Goods - Two Prices" diagram, which provides a foundation for the demand curve. The "Intertemporal Substitution" exercise extends this analysis to explain savings behavior. Turning the focus from supply and demand for output toward supply and demand for inputs yields "The Demand for Labor" and "Labor Supply, Income Taxes, and Transfer Payments." The collection of macro models is organized to convey a sense of the historical progression of economic thinking about business cycles. 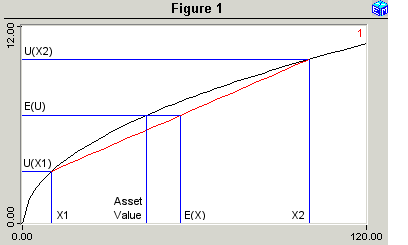 The models included are the Classical Model, the Simple Keynesian Model (the Keynesian Cross), IS/LM with and without flexible prices, the Mundell-Fleming Model, the Real Business Cycles Model, and the IS/MP Model. To the right is an excerpt from the Mundell-Fleming exercise. The Mundell-Fleming Model extends the IS/LM framework to allow for trade in goods and capital flows between countries. Users can choose between flexible and fixed exchange rate regimes. The financial markets models include an analysis of "Utility-Based Valuation of Risk" and "Mean-Variance Analysis: Risk vs. Expected Return." 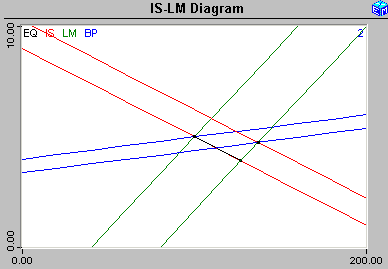 An example of the former is shown to the left. Two online calculators determine present values and rates of return for fixed income securities and for income streams that, like dividends and personal income, that might be expected to grow with inflation.